Bharat Book Bureau Provides the Trending Market Research Report on”Global Freeze Dried Foods Market Size study, by Type & Regional Forecasts 2018-2025”under Food & Beverage Category. The report offers a collection of superior market research,market analysis,competitive intelligence and Market reports. The major restraining factor of global freeze dried products are high manufacturing & product cost and availability of other dried technique such as spray dried product. The Freeze dried foods are considered to be one of the best dehydrated forms of food due to their texture and taste are retained after rehydration. The Foods which can be freeze mainly include fruits, vegetables, meat, fish and dairy products. Freeze dried food tend to retain most of the nutritional quality, taste, shape and size. They do not require refrigeration and can last for months or years. It can also be rehydrated very quickly and easily, unlike dehydrated foods. There are extra costs associated with investing in freeze dried foods. However, when you factor in the long shelf life, these foods are very cost efficient. 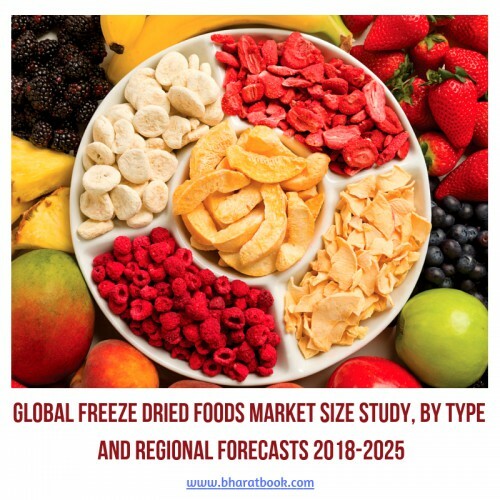 The regional analysis of Global Freeze Dried Foods Market is considered for the key regions such as Asia Pacific, North America, Europe, Latin America and Rest of the World. North America has accounted the leading share of total generating revenue across the globe due to wide range of innovative food preservation technologies. It accounts for 34% share in the total market. Europe is also contributing major share in the global market of Freeze Dried Foods. Asia-Pacific region is also anticipated to exhibit higher growth rate / CAGR over the forecast period 2018-2025, due to fast growing economies and changing lifestyle. South America and Asia-Pacific are the potentials markets owing to the shift of pharmaceutical and food industries from developed to developing regions.